I am not a big fan of buying gifts or cards, especially when they are from children. Their handwriting and artwork are so sweet and perfect to capture in a gift. 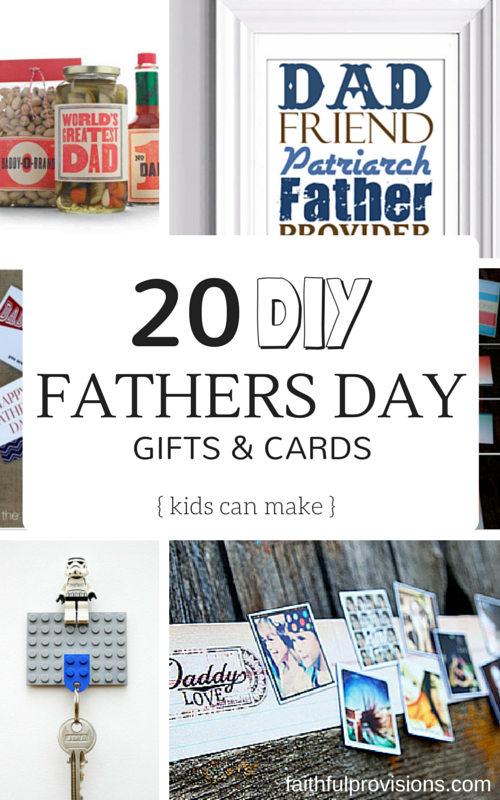 Here are some of my favorite ideas kids can make to give as Father’s Day Gifts and Cards. Of course, my absolute favorite of all listed here is the one below. Those cute faces kind of seal the deal! Father’s Day Questionnaire: This might be my favorite, our church used to have the kids fill these out and give them to us. Perfect for ages 8 and younger, I belly laughed reading some of my kids answers. You can print this out and then help the kids fill it out. This post has lots of ideas on how to jazz up this little printable and make it a fun and special keepsake. 6 High-Quality Printable Greeting Cards: There are 6 different designs to pick from and these are super cute. Probably the best choice if you are short on time and energy! 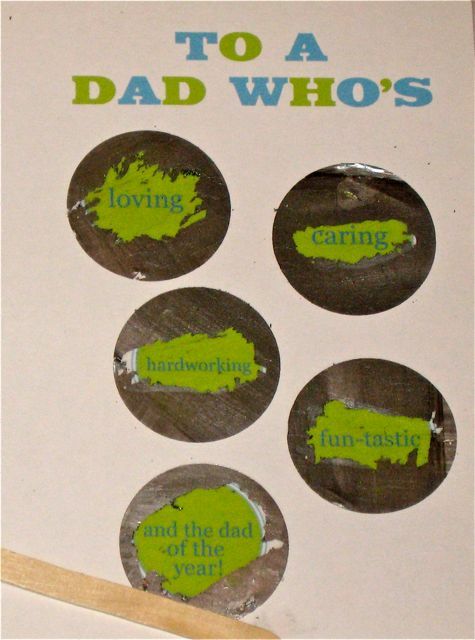 DIY Scratch-Off Card: Follow these simple directions to make dad a creative scratch-off style card at home. 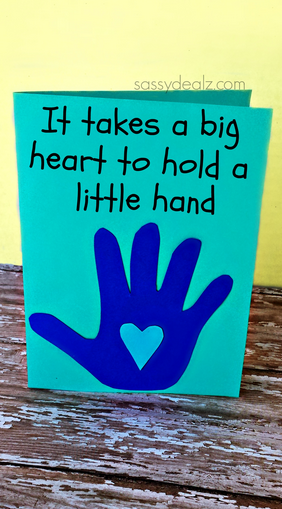 Handprint Card : Perfect way to capture that sweet hand print while they are small. Golf Tee Card : Got a golfer in your home? This is a great crafty way to use those extra tee’s in his golf caddy. 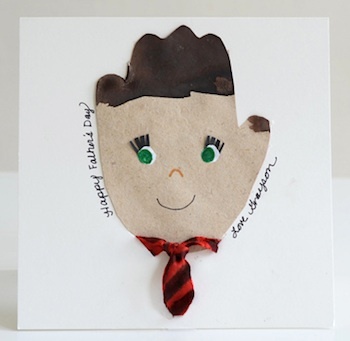 Handprint Tie Card : Perfect for those budding crafters and creative little ones in your home. 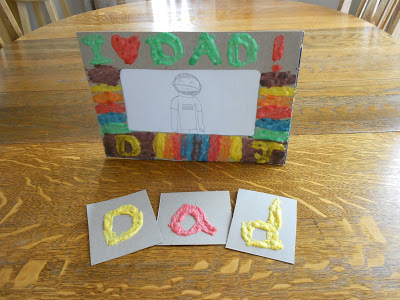 Give them a bin with lots of odds and ends and see what they come up with to decorate their “Hand Dad” card. 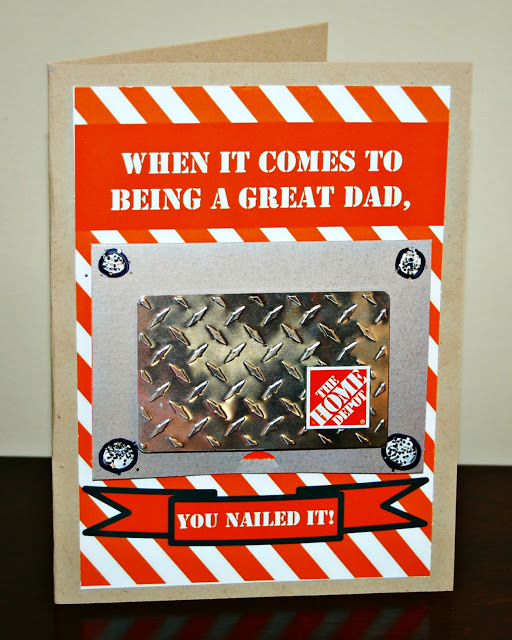 Home Depot Gift Card Holder Card: I love this as a last minute customizable gift for the dad who loves home improvement projects. Just print off the gift card holder, head to the store and buy a Home Depot Gift card and you are done! Short on time? Go to this link to get a Home Depot eGift Card you can print out! 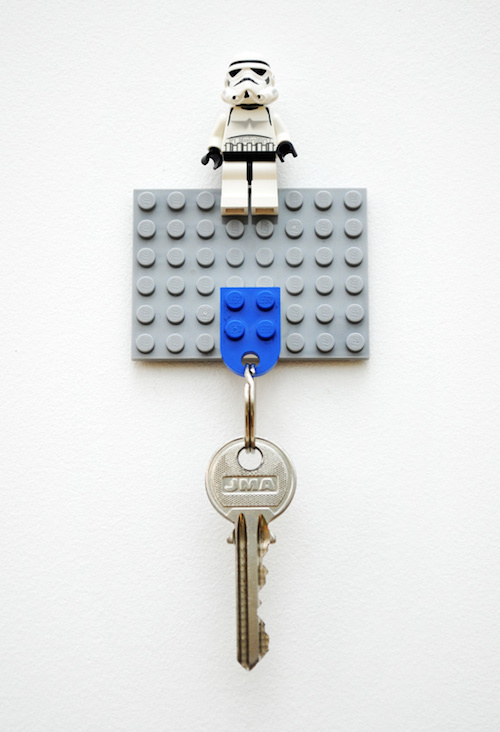 DIY Lego Key Holder: Got any Lego fans in your house? This is the perfect gift they can make for dad’s keys. Printable Book for Dad or Grandad: This is a great option if you also have a grandad you want to recognize. Just print out this book, fill it out and then follow the directions on how to assemble. 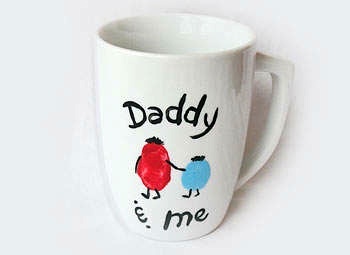 A perfect keepsake for dad or granddad. A printable for each here. 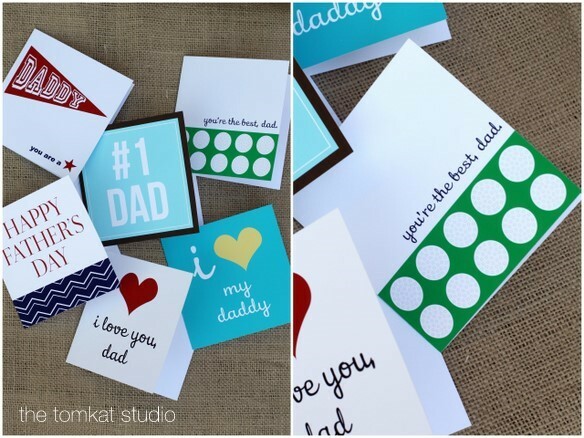 Instagram Magnet Strip Bulletin Board: Head over to StickyGram9 and order some of your favorite Instagram photos as magnets, then use this great tutorial from WhipperBerry to make your own customized Father’s Day Magnetic Board to put them on. This one is a little more involved, and perfect for those DIYers in the house. 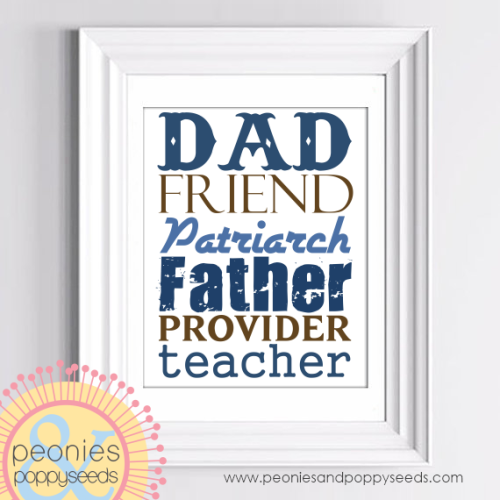 One Father Framed Printable: Print off this “One Father…” quote and just drop into your favorite frame. Super easy and great if you love printable art. It comes in multiple background color options: black, green, blue, charcoal, orange and more! Subway Style Art Printable: Here is another great printable art piece you can frame and give to dad. This one will use a little less ink than the one above and I love the bold male messaging on this one! 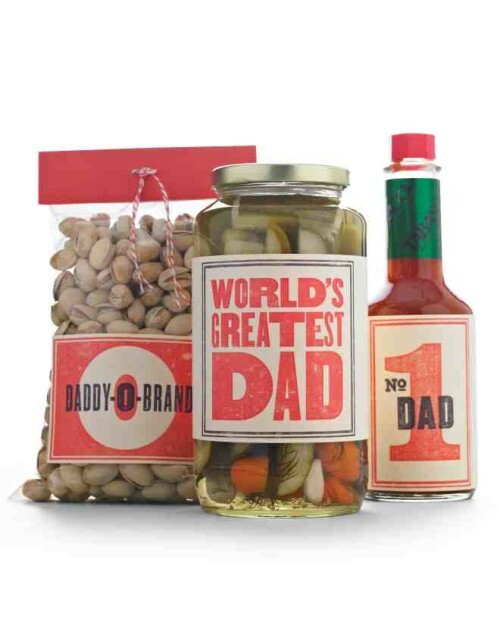 Retro Clip Art Label Printables: These are really cute to attach to dad’s favorite snack foods. In our house, this would be added to a bag of gummy bears. 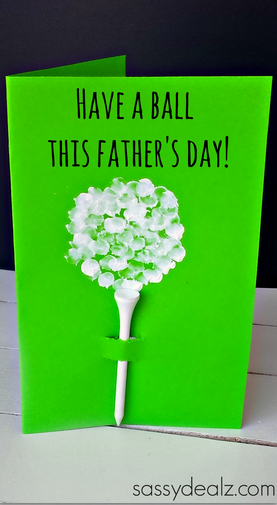 Just paste over the current label to make a customized gift for dad in a retro style. 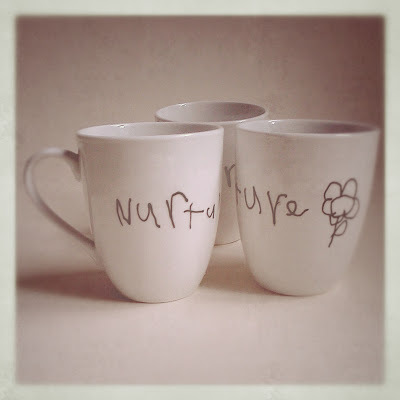 Sharpie Coffee Mugs : These are so easy and you can do this same concept using sharpies instead of ceramic pens. Either way it turns out great. Fingerprint Coffee Mug : These are precious fingerprint coffee mugs, similar to the one above but a little different design idea! 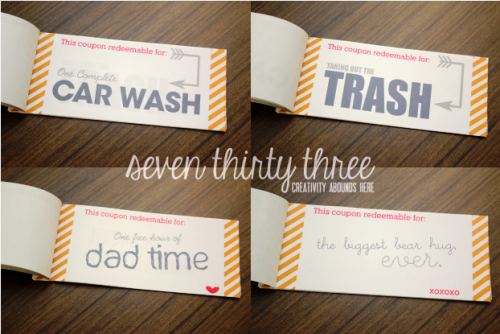 DIY Printable Coupon Book: Print this coupon book out by Seven Thirty Three, staple it together and let your littles had it off to dad with a smile. 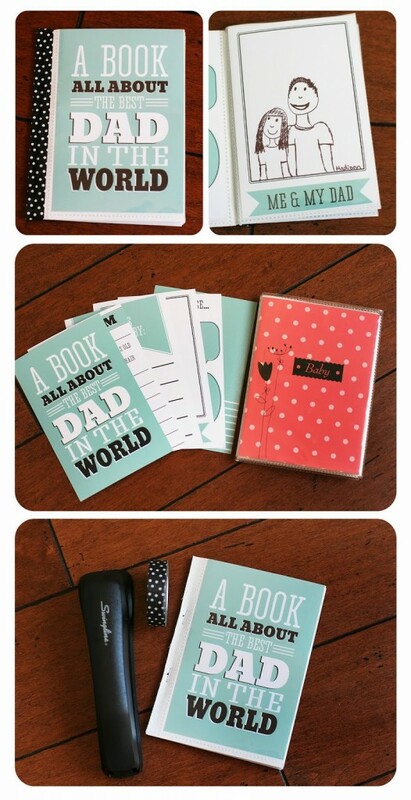 Printable Coupon Book: Another really cute printable coupon book for dad. DIY Puffy Paint Frame : Using a few things around the house, you can make your own puffy paint and frame for a picture. 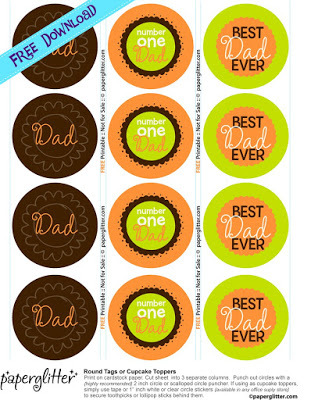 Circle Tags or Cupcake Toppers: This is perfect for the little baker. Have your kids make their favorite cupcake recipe and top them with these precious cupcake toppers. 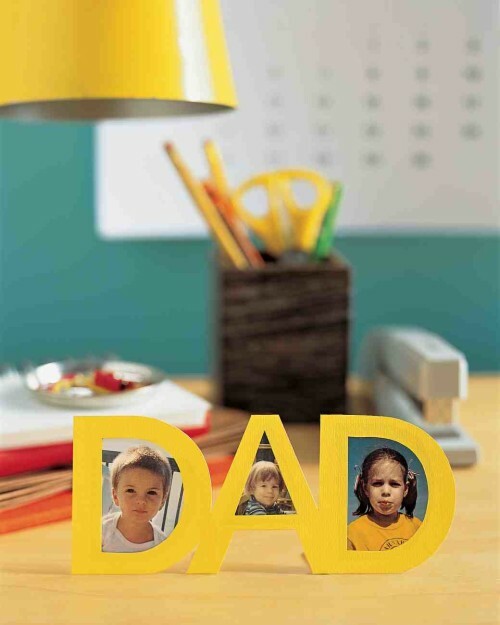 Cut Out D-A-D Frame: Cut out the letters D-A-D and pop in your favorite pictures, this one is from Martha Stewart.